OAS is proud to be part of the Bissell Partners for Pets Program. This year we will be participating in Bissell’s Empty the Shelters Event. Stay tuned for more information! 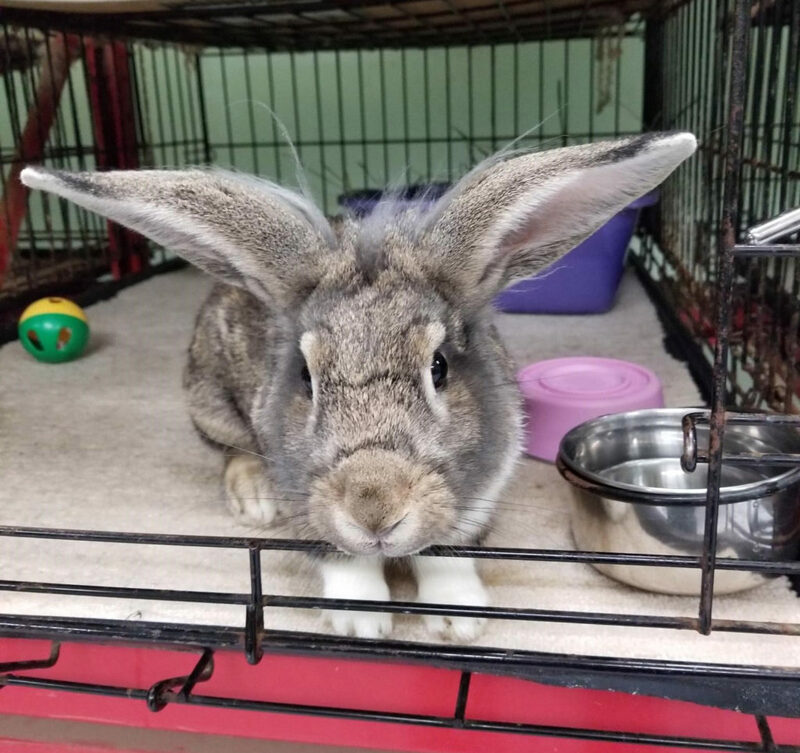 Cardamom, OAS bunny available for adoption for life, not just Easter! A week after Easter, the candy will be forgotten, and sadly so will the rabbit. Rabbits are a lifelong commitment! They can live 10-12 years, and need special care and love year round, not just at Easter. Please consider this before adopting a rabbit. Jade is a friendly happy girl and is a perfect medium-sized companion at about 35 lbs! She loves to snuggle and makes the cutest snorting sounds. More about Jade can be found on her online page. Jade can get overwhelmed by pushy dogs so she’d be most comfortable in a home without other dogs. She would do best in an adult-only household. Help the FOAS Running Team raise $15K as they participate in the Oakland Running Festival! 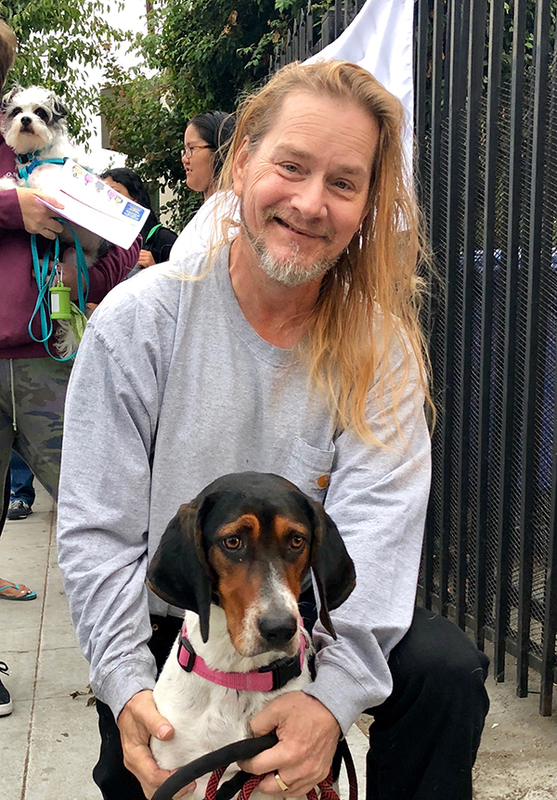 The Friends of Oakland Animal Services have put together a running team to participate in the Oakland Running Festival half-marathon on March 24, 2019 and raise $15,000 for much-needed programs like the free Pet Fix clinics. They have been training hard and now need your help to get them to $15,000. The team also invites everyone to celebrate after the race with a benefit dinner at Sanctuary Bistro in Berkeley. The restaurant will be donating 30% of all dinner food sales on March 24 to FOAS. We hope to see you there! FOAS, OAS, and Cat Town need your vote!! 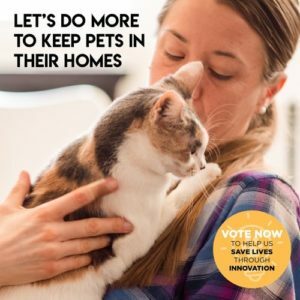 Cat Town, in partnership with Oakland Animal Services (OAS) and Friends of Oakland Animal Services (FOAS), has been selected as one of seven organizations across the nation to compete for a finalist spot at the 2019 Innovation Showdown. This is a chance to fund a 2-year pilot project to help at-risk animals stay with their families and get adopted with as little stress as possible. Please vote to help us keep pets in homes — and keep our shelter a last resort for animals in need! Calling all cats and dogs (of all sizes!) in need of a fix! Friends of Oakland Animal Services’ next free spay/neuter day is coming up on Sunday, February 10, 2019. No appointment is needed for this event. 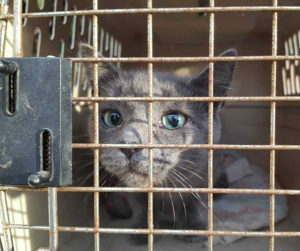 Oakland residents of limited financial means may bring pet cats, feral cats in traps, and pet dogs (of all sizes). Pets will be checked in from 7:30 – 8:30am on a first-come, first-served basis. Surgeries will be performed by licensed veterinarians inside the East Bay SPCA spay/neuter clinic facility. Animals will also receive free vaccines and microchips. Note: Cats and dogs must fast after midnight the night before surgery. Pets may drink water after midnight. This program is available to Oakland residents only. You will be asked to provide an Oakland address at check-in. This event is fully funded by Friends of Oakland Animal Services and is made possible by the generosity of FOAS donors. Support our program to prevented unwanted litters in Oakland! The new schedule is more in keeping with industry standards – another move marking the great progress the shelter has made toward becoming an industry leader in the past four years. 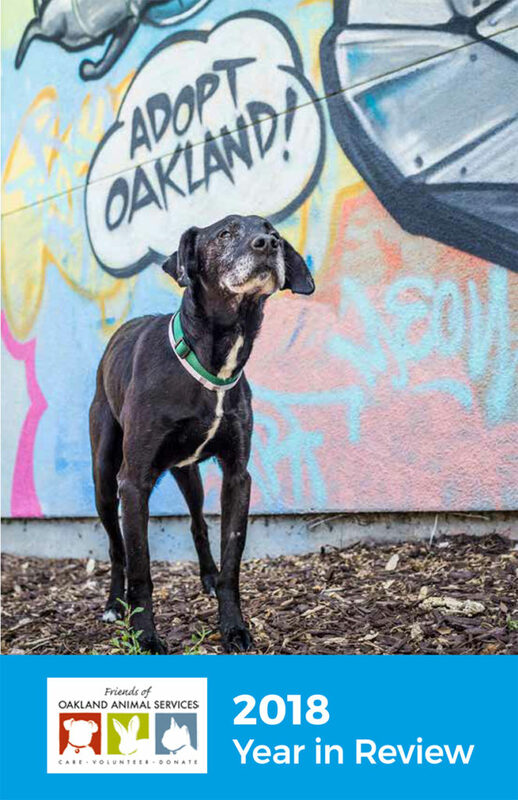 OAS became a standalone City department in January 2015, and since then has made tremendous strides for the city’s homeless animals – and for the Oakland residents who care for them. Just a few years ago, the dogs, cats, rabbits, birds, guinea pigs, and countless other animals who arrived at the shelter’s doors faced an uncertain future. 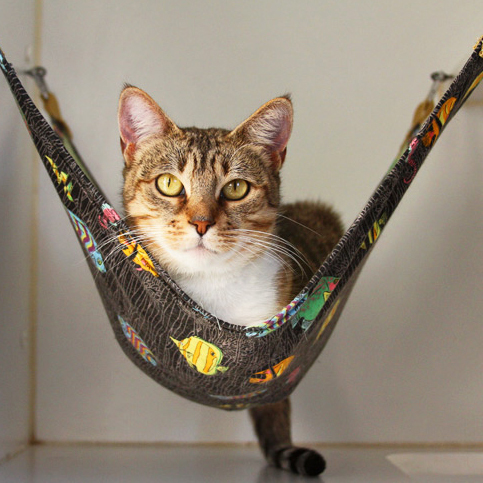 But now, as 2019 begins, OAS routinely rescues and saves the lives of more than 80 percent of the animals taken in – a 50 percent increase over the shelter’s “live release” rate just a few years ago. Meanwhile, the number of dedicated volunteers who support the department and the animals in its care has doubled. The shelter boasts a volunteer program that is equivalent to thirteen full-time employees. 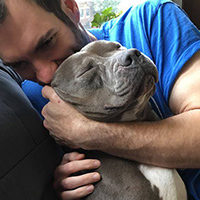 OAS has also increased its number of adoption partners – organizations in California and beyond who have capacity to take in hard-to-place animals rescued by OAS – by nearly 40 percent. Animals with life-threatening conditions, such as puppies with parvovirus, can receive treatment through support from the nonprofit Friends of Oakland Animal Services (FOAS). 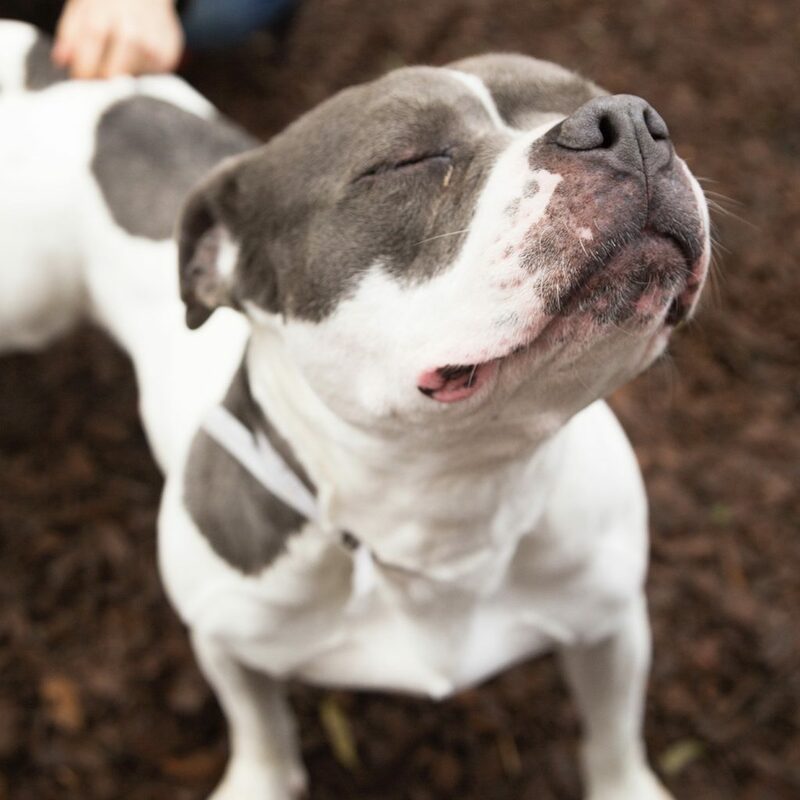 Additionally, FOAS funds key lifesaving programs, such as foster care for shelter animals, and a new, free spay/neuter program for Oakland residents. OAS has also made great strides in recruiting and hiring full-time staff dedicated to serving both the animals and humans who need its assistance. Today, there are 35 full-time staff members, and since 2016, the shelter has employed a full-time veterinarian to provide critical medical attention to the thousands of animals arriving at its doors. As for New Year’s resolutions? OAS still recognizes tremendous need in Oakland and, budget permitting, aims to increase hours for public service in its next four years of progress. 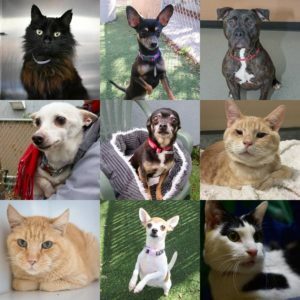 Animal lovers who wish to support the shelter’s ongoing work to improve the city’s services for its homeless animals can make a tax-deductible gift to Friends of Oakland Animal Services’ year-end campaign to raise $25K to support lifesaving medical care for homeless animals awaiting their a second chance in the new year. Oakland Animal Services is Oakland’s only “open admissions” shelter. Located at 1101 29th Avenue, the shelter accepts all of Oakland’s lost, abandoned and mistreated animals, including farm animals and native wildlife. 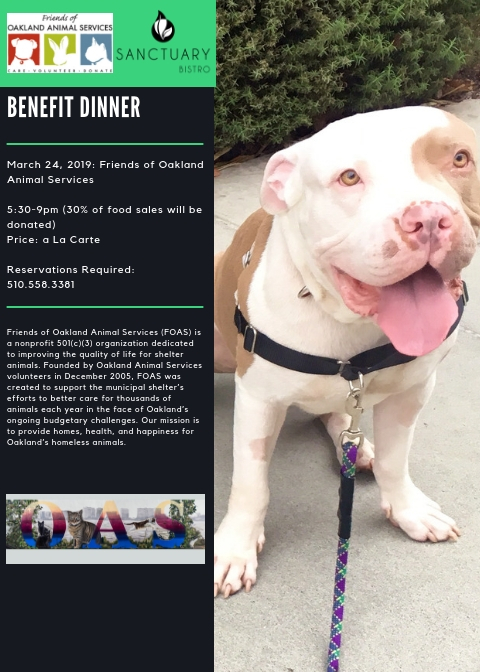 Friends of Oakland Animal Services (FOAS) is a 501(c)(3) nonprofit organization dedicated to providing homes, health, and happiness for Oakland’s animals. Visit www.oaklandsanimals.org or contact info@oaklandsanimals.org for more information. With the assistance of a dedicated group of volunteers, donations and the support of nonprofit FOAS, OAS has served more than 5,000 animals in 2018 alone. Visit the shelter to adopt, volunteer or donate. The Friends of Oakland Animal Services is hiring! The Spay/Neuter Program Coordinator is a key role in the day-to-day operations of Friends of Oakland Animal Services’ free spay/neuter program. You’ll be our main point of contact with Oakland residents wishing to participate in the program, ensuring that appointment and voucher requests are handled promptly, keeping detailed records in our database, and being on-site to oversee our monthly events. Bilingual English and Spanish speaking and writing ability a must. The coordinator also manages FOAS donor data entry, acknowledgements, and mail support.